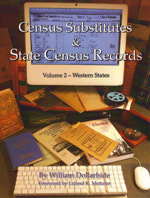 This is the second volume in a two volume series by William Dollarhide in which he identifies Census Substitutes, as well as State Census Records for the United States of America. The substitutes are those name lists derived from tax lists, directories, military lists, land ownership lists, voter registrations, and other compilations of names of residents for an entire state, one or more counties of a state, or one or more towns of a county. Thirty-seven states conducted colonial, territorial, or state censuses that are extant and available for research today. Usually taken between Federal Decennial Census years, these records often contain unique information, and may even shed light on the lives of your ancestors that may have been on-the-move. This volume (second in a series of two) contains historical timelines and detailed bibliographic descriptions of records covering Texas, Oklahoma & Indian Territory, California & Nevada, Alaska & Hawaii, Nuevo Mexico, the Mountain West, and the Oregon Country. 220 pp, Softcover, Perfectbound, Printed on acid-free 60# cream vellum, 2008.